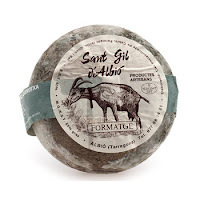 Garrotxa is a goat's milk cheese once produced solely in the Garrotxa area of Catalonia, Spain. 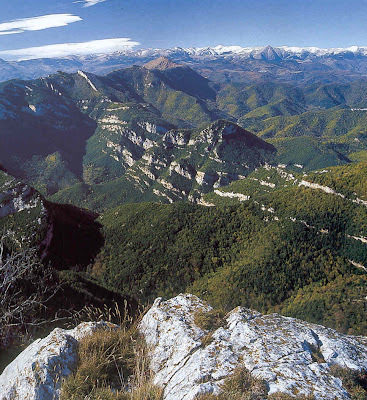 This area of Pyrenees is the farthest East, lying right on the shores of the Mediterranean Sea. Made in a traditional manner by a small artisanal creamery known for its consistently high quality, these beautiful wheels have a semi-soft and compact texture with a light but noticeable coating of velvety, blue-grey mold. The flavor is milky smooth and delicate with a hint of hazelnuts and a clean, crisp finish of young grass. Garrotxa pairs well with most sparkling wines and Champagne, with whites, as well as Iberian varietals including: Albariño, Tempranillo, Periquita, Garnacha, Sherries and Portos.